Corn on the Cob Frozen w/husks on. Nip off ends and wash, freeze with husk intact. 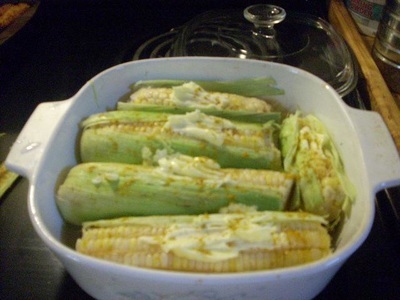 Take out and strip away a portion of the husk, Fresh corn - buttered and seasoned with sea salt, and ready for the oven. Cover in foil and bake for 30 minutes @350 degrees. Or wrap individually with foil and place on the grill for about 20-25 minutes. Mix all together in bowl and pour into greased baking dish. Bake for 45 minutes @ 400 degrees. 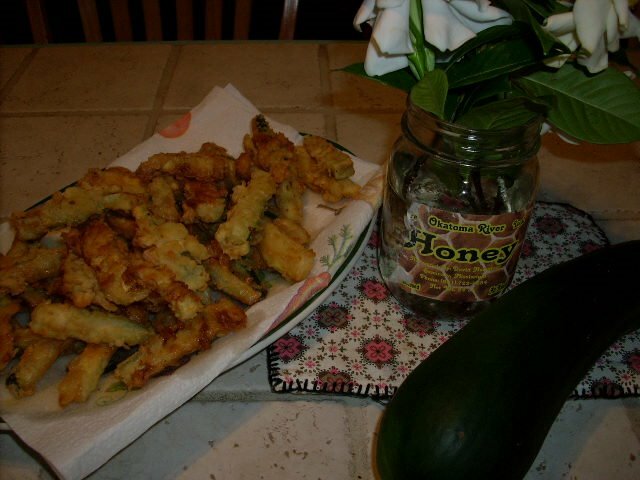 This is a recipe that I found while surfing the web...I learned how to make this at the Southern Living Cooking School at USM. I also won one of the door prizes - a set of enamel cookware...wonderful to cook with, next to stainless steel I'd say they are the best. 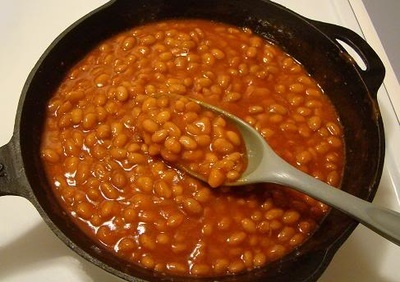 But of course I wouldn't take anything for my cast iron skillets...I cook 'everything' in them, from Fried Chicken to Chili to Baked Beans, to Bar-b-Q'd ribs...Cast iron is good for all sorts of dishes! I do try to stay away from aluminum. Preheat the oven to 400 degrees F. Use 1 tablespoon butter to grease a 2 pint soufflé dish, sprinkle in one tablespoon of cheese. 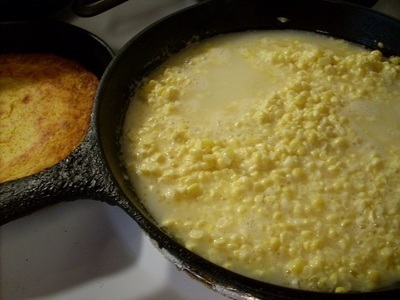 Melt the remaining butter in a large pan. Stir in flour and cook for 2 minutes over a low heat. Remove from the heat and slowly pour in the hot milk, whisking well, then season with salt and pepper and cook again stirring continuously until the sauce is smooth and thick. Beat in the egg yolks, one at a time and put the mixture to one side. Beat the egg whites until stiff and fold them into the mixture, then fold in the remainder of the cheese. Put the mixture into the prepared soufflé dish and smooth the top. Put it in the oven and lower the heat to 350 degrees F. Bake for about 25 minutes, until the soufflé has risen above the edge of the dish, and serve immediately. Cook the macaroni using the package directions; drain. Melt the butter in a large saucepan over medium heat. Stir in the flour. Cook until smooth and bubbly, stirring constantly. Stir in the milk, cream cheese, mustard, salt and pepper. Cook for 3 minutes or until thickened, stirring constantly. Stir in the macaroni and cheese. Place in a 2-1/2-quart baking dish sprayed with nonstick cooking spray. Add extra cheese on top if desired. Bake at 400 degrees for 15-20 minutes or until golden brown. Yield: 4-6 large helpings. Cook pasta and drain. In a large saucepan, cook onion in butter until soft. Stir in flour. Add milk. Cook and stir until bubbly. Add shredded cheese and stir until melted. Add drained pasta to cheese sauce, and stir to coat. 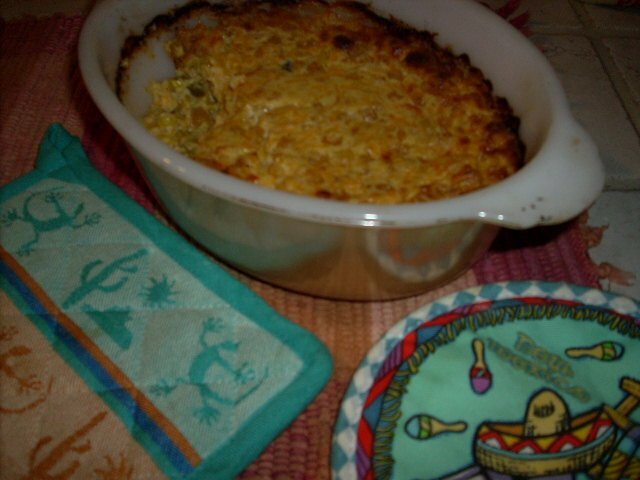 Spoon mixture into 2 to 2-1/2 quart casserole. Combine melted butter and breadcrumbs, and sprinkle over the top. Bake casserole in a 350 degree F oven until bubbly. Let stand 10-15 minutes before serving. •) 2 - 3 heaping Tablespoon's mayonnaise Less is better, you can't take it out once it's in there. 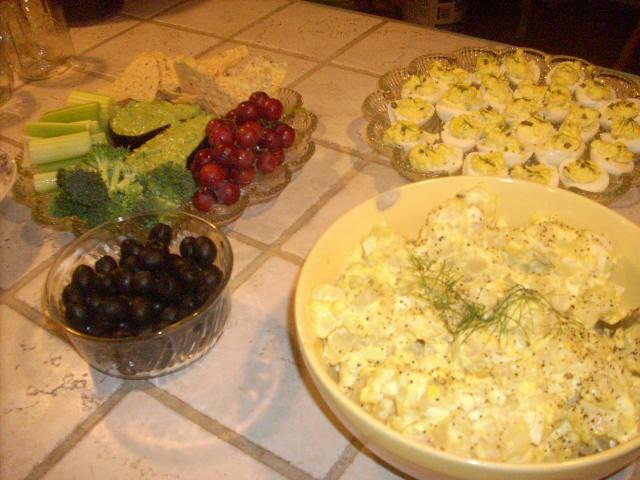 Paprika, celery seed, dill weed, course black pepper, green olives, parsley, etc for garnish. add lemon juice and cheese. Stir well. Spoon sauce over broccoli. Heat in oven 5 mins. Mix all together, pour into greased casserole dish. Bake at 350° for 20 to 25 mins. The yellow squash is sometimes called crookneck or yellow summer squash...It is pale yellow when young and tender...and it is very good! I slice it up thin, about 1/4 of an inch, in a skillet with about a 1-2 T butter or olive oil on medium heat. 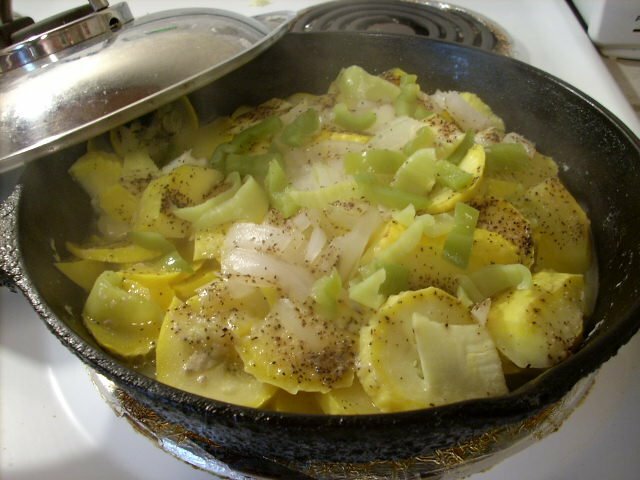 I heap the squash to the top of the skillet. Add chopped onions, salt, pepper, and about a 1/4 cup of real butter on top of the squash. Cover tightly, turn it down to medium low, and let simmer until done, approx. 20-25 minutes. Watch closely that it doesn't dry out and burn. Sometimes I let it get golden brown on bottom. With a spatula pick up and look underneath, but don't stir or mix. Add a little more butter if needed around edges to help it brown. You can also just stir-fry it over medium heat without covering it - but then it wouldn't be called smothered squash. Variations: Use same recipe for most vegetables such as sliced potatoes, greens, or okra w/tomatoes and onions. Use your imagination and create a new dish your family will love! Cook the squash with onions, butter or olive oil, salt and pepper (steam), put in 2 eggs, a heaping tablespoon mayo, a handful of crushed crackers, about a 1/2 cup grated cheese. Mix well. 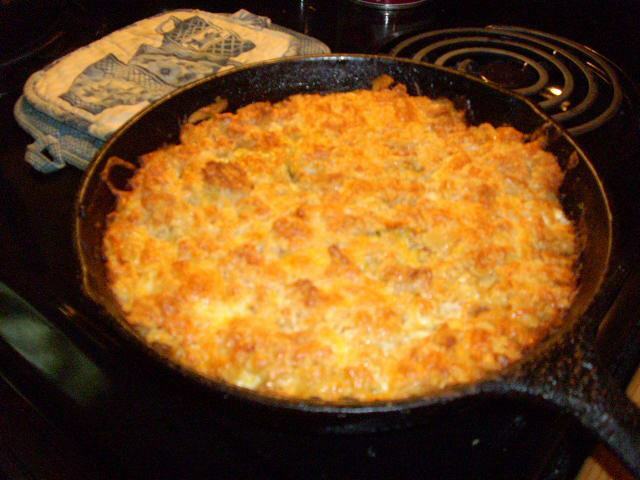 Top with grated cheese, and crushed crackers that have been tossed in melted butter. Bake til golden brown, and bubbly around edges. Get oil hot on med-medium high. Mix egg with buttermilk, stir well. Dip fries in batter, then roll in flour, place in pan, sprinkle with salt and pepper and cayenne and fry in until golden brown, turning once or twice.